I don't feel like Aeon get enough credit in the greater death metal scheme of things. Hopefully Aeons Black can change that. Aeon may lean a little more towards execution over evolution, but there's nothing new under the sun anyway. Aeon, and this album especially, slide right into the space on the shelf between Cannibal Corpse and Deicide. 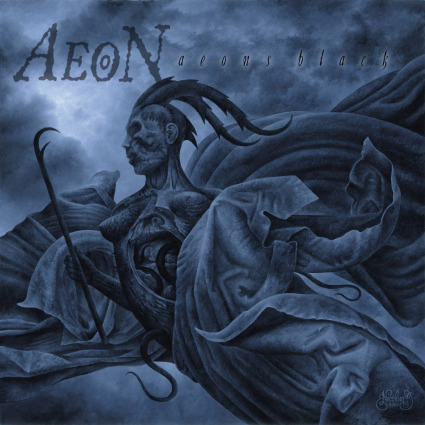 Gloriously blasphemous with a classic DM feel, Aeons Black is whiplash inducing and throat shredding. With killer riffs and satisfying solos, catchy vocal lines, and enough determined fury to burn down a stone church, Aeon are quickly becoming one of my favored death metal bands. Perhaps Aeon will win another Kingdom of Noise Death Metal Song of the Year Award. The "Where's your Saviour?! Where's your God?!" part in the title track makes a strong case!